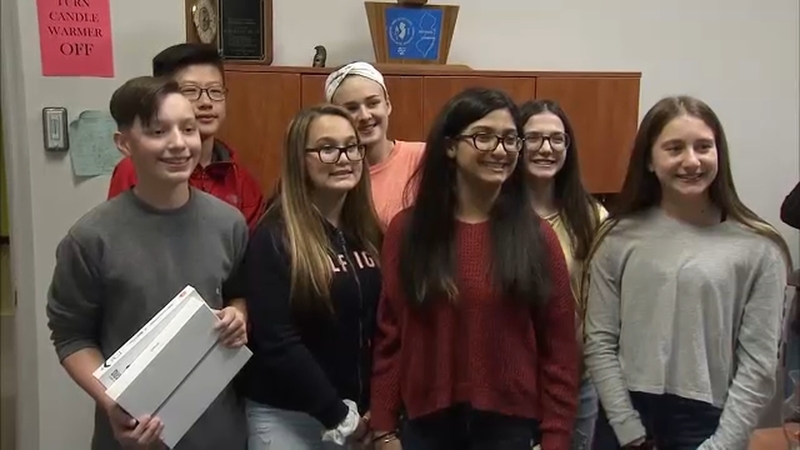 Students surprise classmate with new iPad. Jeannette Reyes reports during Action News Mornings on April 12, 2019. SEWELL, N.J. (WPVI) -- When Zedeno Hernandez's brother Avyan gets upset, he usually calms down by using the iPad the siblings share. Avyan, 14, has autism, and the tablet is very important to him. However, during a car ride last week, Zedeno said his brother got mad and threw the iPad out the window. The boys' mother Ashley Hernandez told Action News, as a single mom who is currently unemployed, she did not have the means to purchase a new iPad. Zedeno, 13, shared with his friends and teachers at Monongahela Middle School in Sewell, New Jersey, how much the tablet meant to his brother. But his friends just couldn't listen to Zedeno's story without helping out. So they came together and raised money to buy the brothers a new iPad. Now, it was just a matter of deciding how to give Zedeno the new tablet. At first, the students came up with the idea for their 7th grade science teacher Tammy Bitting to give Zedeno a faux detention - that way they could really surprise him! "I felt awful. I couldn't give a kid a detention for no reason. And he's a good kid. It would make him upset and I didn't want to do that," Bitting said. So the group decided on Zedeno getting pulled out of class on Thursday and then presenting him with the gift. As the 7th grader walked into Vice Principal Maureen Bilda's office, he was feeling as if he was going to detention. "I got pulled out of class and I got scared. I thought I was going to get in trouble," Zedeno said. But as soon as Zedeno entered the room, he was greeted by his classmates who handed him a gift bag. Inside the bag was a brand new iPad, a case, and a gift card. As he stared at his tablet, Zedeno laughed along with friends, trying to the find the right words to say to them. "Thank you," Zedeno said. "Wait, this is for my brother, right?" His friends confirmed it was. "I'm really glad because it's going to help my brother a lot because he uses his tablet a lot to help with situations when he gets upset," Zedeno told Action News. Ashley was grateful for the kindness displayed by the teens, not only to their friend Zedeno, but to his brother, too. "I thought it was extremely nice of young children to think of a friend like this and to do something for him, so I wanted to make sure they are recognized for what they did," Ashley said. When Zedeno learned of the original detention idea, he laughed. Ms. Bitting told him that his classmates put this plan all together in less than a week. He turned to his friends, and once again said, "Thank you."